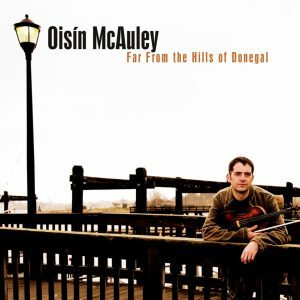 McAuley grew up in a quiet, rural part of Western Ireland, speaking Irish as his primary language and honing his craft in the wide-ranging and experimental style of famed fiddle player John Doherty. “You’ll hear a lot of John Doherty on this record, both his music and his style,” McAuley says. “He mixed up and changed things a lot, so in a way it was easier for me to mix up different types of tunes.” On this project that mix includes Port Na Bpucai (or Tune of the Fairies), a piece that reaches back into the tradition, Swing and Tears from Breton composer and guitarist Gille Le Bigot, and a set including Paddy Fahey’s My Former Life/Paidin O’ Raifertaigh/The Rumors of a Dart. The last tune is McAuley’s own composition, as are several other pieces on the disc. “The Scottish or Irish tunes that you hear on there are ones that I’d picked up along the way, that are special to me, and ones that I hadn’t heard many other people play, except for the people they came from. I wanted to include some tunes that I had composed myself, too. That’s something I love to do,” McAuley says.